KURASHIKI, Japan (REUTERS) – Japan struggled on Tuesday (July 10) to restore utilities after its worst weather disaster in 36 years killed at least 155 people, with survivors facing health risks from broiling temperatures and a lack of water, while rescuers kept up a grim search for victims. Torrential rain unleashed floods and landslides in western Japan last week, bringing death and destruction, especially to neighbourhoods built decades ago near steep slopes. About 67 people are missing, the government said. Prime Minister Shinzo Abe has cancelled an overseas trip to cope with the disaster, which at one point forced several million from their homes. The premier faced some criticism after a photograph made the rounds on Twitter showing him and the defence minister at a dinner with lawmakers last Thursday, just as the rain was worsening. Abe has seen his support rates rebound after slumping over a suspected cronyism scandal and is keen to prevent any declines ahead of a ruling-party leadership race in September. Power had been restored to all but 3,500 households but more than 200,000 people remain without water under scorching sun, with temperatures hitting 33 Celsius in some of the hardest-hit areas, such as the city of Kurashiki. “There have been requests for setting up air-conditioners due to rising temperatures above 30 degrees today, and at the same time we need to restore lifelines,” Finance Minister Taro Aso told reporters after a cabinet meeting. Roads caked in dried mud threw up clouds of dust when rescue vehicles or other cars drove by. Stunned survivors recounted narrow escapes. “It was close. If we had been five minutes later, we would not have made it,” said Yusuke Suwa, who fled by car with his wife early on Saturday when an evacuation order came after midnight. A quarter of flood-prone Mabi district of Kurashiki, sandwiched between two rivers, was inundated after a levee crumbled under the force of the torrent. 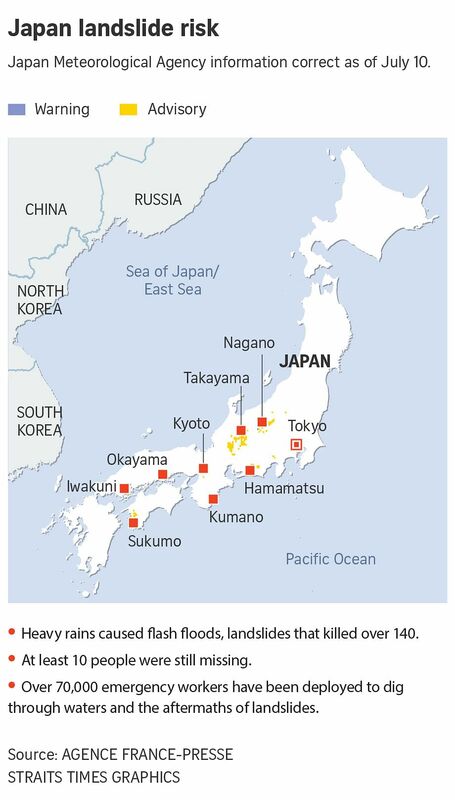 Japan issues weather warnings early, but its dense population means that almost every bit of usable land, including some flood plains, is built on in the mostly mountainous country, leaving it prone to disasters. Some residents of Mabi had shrugged off the warnings given the area’s history of floods. “We had evacuation orders before and nothing happened, so I just thought this was going to be the same,” said Kenji Ishii, 57, who stayed at home with his wife and son. But they were soon marooned by rising flood waters and a military boat had to pluck them from the second floor of their house, where they had taken refuge. Hundreds of residents of Mabi were taking refuge in a school on high ground. “Everything was destroyed and both of our cars were totalled as well,” said a woman in her forties, who was taking shelter in the gym with her brother and parents. Most of the deaths in hard-hit Hiroshima were from landslides in areas where homes had been built up against steep slopes, beginning in the 1970s, said Takashi Tsuchida, a civil engineering professor at Hiroshima University. “People have been living for 40 to 50 years in an area that had latent risk, but decades went by without disaster,” he said. “But intense rainfall has become more frequent, and the hidden vulnerability has become apparent,” he said. Though the weather has cleared up, the disaster goes on. A new evacuation order went out on Tuesday in a part of Hiroshima after a river blocked by debris overflowed its banks, affecting 23,000 people. Another storm, Typhoon Maria, was bearing down on outlying islands in the Okinawa chain but it had weakened from a super-typhoon and was not expected to have any impact on Japan’s four main islands.